From an outsider’s perspective, growing up in the San Fernando Valley may seem something of a bland existence compared with the rest of L.A., but Valley dwellers know all the gems, landmarks, and events that made our youth so memorable. And as a kid who grew up in the SFV I thought it might be fun to share some of the highlights, and maybe drum up a bit of nostalgia in my fellow Valley born-and-breds. Granted, this list is undeniably biased (I am a child of the 1990s after all) and there’s no way to include every single experience shared within so many neighborhoods but I’m sure all those who grew up in the 818 can relate to at least some parts. 1. You went on an awkward middle school dates or hung out with your friends at the mall (Northridge, Sherman Oaks Galleria) because that’s the only acceptable place to hang out even if you’re broke (which you likely were). 2. You got ice cream at Thrifty’s (THE best) and/or a local small ice cream joint (shout out to the soft serve ice cream at Foster’s Old Fashion Freeze). 3. You didn’t just go to the movies to see a film so choosing the best theatre was a big deal. Maybe it was the Pacific theatre at the Northridge mall or on Winnetka or the AMC 16 at the Topanga mall, either way it was about which was the “coolest” and offered the best pre/post-movie activities. 6. Having to jump or at least walk through the fountain at CityWalk because it never gets old. 7. Going to Universal Studios for Back to the Future and E.T. (RIP, you are both missed) and knowing E.T. would always call out your name after you’d pass him. 8. Before Starbucks and Coffee Bean we had Winchell’s and other strip mall donut/coffee shops that you rarely identified by name but rather by what street they’re on. 9. Going to countless birthday parties at your local park, Skateland, or Chuck E. Cheese. 10. You mainly ate at strip mall eateries so going to an actual restaurant felt like a big deal even if it was just Sizzler. Personal favorites: Mercado Buenos Aires and Taqueria Juanito’s among others. 11. Shopping at FedCo, Pic ‘N’Save, Montgomery Ward, The Broadway, Robinson’s May, Alpha Beta, and Lucky’s. 12. Wasting time waiting for the bus that was almost always late, using someone else’s day pass before we had TAP cards, and appreciating when they installed TVs and started announcing streets. 13. Going to the drive-in and hiding in the back or maybe even the trunk to avoid paying. I saw Clueless at the Van Nuys Drive-In and it really doesn’t get any more 90s than that. 14. Kids these days use textspeak but we had “Like” “bomb” “fool” and other less savory slang terms. 15. Going to and/or working at Blockbuster or Hollywood Video. Netflix and Redbox are great but nothing compares to the options we had back then. 16. Literally all the girls (and maybe some guys) just had to take those overexposed photos with the backgrounds (stars, butterflies, hearts etc.) and you could find studios in the mall and in strip malls everywhere. Before Instagram we had only one filter and about 30-50 photos that we had to personally sign to give to a select group of people (and our crush, of course). Dark liner, barrettes, platforms, chunky highlights, acrylic nails, and tight tops not mandatory but popular. 17. Saving up all your funds, going to Tower Records and finding any and every album you ever wanted. 18. Before the Valley lost all major bookstores (le sigh… also B & N in Burbank is too far for some of us) we walked the aisles of Borders, Barnes & Noble, B.Dalton, and Crown Books only to end up sitting in the magazine section or giggling at the Harlequin books. 19. 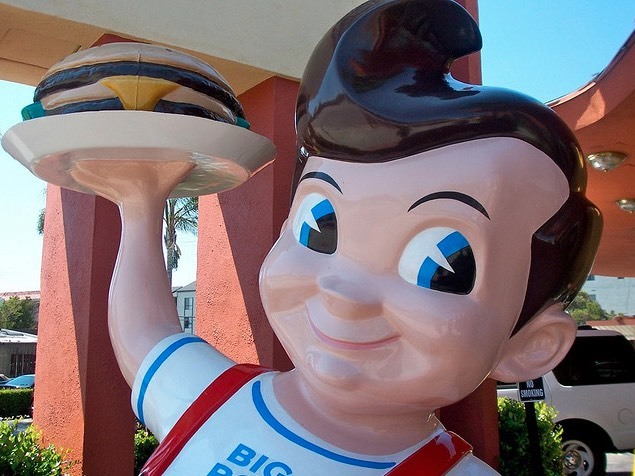 Feeling a certain attachment for restaurants even if you’ve never eaten there because the exterior is so memorable somehow: Cupid’s Hot Dogs, Heart’s Coffee Shop, Beeps, Bob’s Big Boy etc. 22. Finally discovering what the big deal is with In-N-Out and being grateful it’s open late because hardly anything else in the Valley is. 23. Going to the library closest to school (Mid-Valley Regional Library!) and checking out a computer just to chat online. 24. Pepe’s Kartland. That is all. Although This list is specific to the 90s but feel free to share your Valley love for any decade in the comments below.